It is two weeks before Christmas and I have a confession today: I have not gotten a chance to complete my Christmas gift list. It's just been really busy lately because of major transitions going on right now and honestly, I have been feeling moved to think of gifts that really make a difference. God has blessed us generously this year and I never take for granted that Robert and I have always more than we ever needed. That's how good our Father is! The harsh reality of this fallen world is that not all of our brothers and sisters have everything they need. How wonderful it would be if we really make this Christmas about giving more and not getting more! You probably remember a previous blog entry that I posted about the beautiful girl from Guatemala that we are sponsoring through Compassion International. If you are thinking of other ways to support children through this wonderful organization, I am happy to share with you today the Gifts of Compassion Catalog. WHAT IS THE GIFTS OF COMPASSION CATALOG? An on-line catalog of gift alternatives for friends, family and clients. No crowds, no lines, no stress - just a gift that will help make a difference in the life of a child living in one of the poorest communities of the world. These gifts help provide clean drinking water, medical treatment, disaster relief, food supplies and much, much more for Compassion-assisted children and their families. Meet real needs and bring real joy with a Gift of Compassion. Gifts include mosquito nets, soccer balls, chickens, goats, water filters, farm equipment, clean water and more. Gift prices range from $10 to $5000. There is a tangible gift for every gift budget! Today, I hope that you consider taking gift-giving to another level. 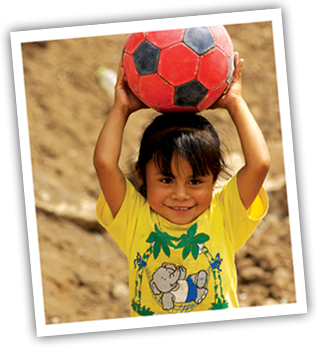 Make a needy child's Christmas extra-special this year through a Gift of Compassion. Awesome! We can't wait to sit down as a family this weekend and choose a gift or two from this catalog! Hello Diane! I saw all over Facebook on VCF's Christmas box drive and it really melted my heart :-) That means thousands of shoe boxes to many more children!